Dave Dresher is a member of the Real Estate and the Banking and Financial Services Practice Groups. He chairs the Banking and Financial Services Practice Group, representing banks and other lenders in connection with lending and workout/restructuring activities, regulatory compliance (including consumer-compliance) requirements, product development, and disputes. In the Real Estate area, Dave represents developers and other owners, users, and brokers of industrial, commercial and multi-family real estate in the acquisition, sale, leasing and financing of such properties, including work with such clients raising investment funds for acquisitions. 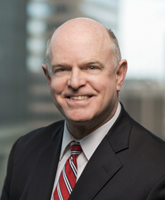 Additionally, Dave serves as counsel to various closely-held businesses and companies in Alabama, working with such companies as a general counsel, advising the clients on a broad range of business issues and coordinating delivery to them of our firm's legal services.